Everyone should read Nelson Mandela’s autobiography! In fact, you probably already have. But I’m a little late to the game and just did it, finally. Long Walk to Freedom is deeply inspiring. It’s the story of an unbelievably strong man who remained a freedom fighter in every aspect of his life, whether he was free or jailed, whether he was trying to dismantle apartheid or simply trying to get Robben Island’s prisoners access to reading materials. More than that, though, the book is a wonderful model for anyone fighting for a just cause against overwhelming odds. Mandela is a master at balancing long- and short-term goals, making smart compromises, and not letting emotion supersede tactics. Perhaps the most moving part of the whole book is Mandela’s willingness, in the end, to partner — in the service of the greater good — with the same people who stole almost everything of personal meaning from his life. For these reasons, Mandela’s book has lessons far beyond the anti-apartheid movement. I can think of applications from the United States to the Middle East to China and Tibet. Luckily for us, he offers up many quotable passages that provide food for thought. Here are my seven favorite, with a note or two on how I think they have broader applications. This is interesting because I think Mandela’s peace-loving qualities are oftentimes confused with him being a pacifist, which he certainly is not. While it concerns me that this quote could be used to excuse needless violence in any resistance struggle — and Mandela only supported violence where it had a clear practical purpose, and then favored property destruction over harm to people — it’s also a reminder that maybe not every freedom movement can be won by Ghandi’s methods alone. While this is surely more relevant in a context of acute oppression like apartheid South Africa, it’s still a bitter truth for anyone — like me — who loves newspapers. The MSM oftentimes tells us as much about ourselves as it does about the subjects it covers. Thank goodness for Jon Stewart. I am sure there are American Indians, Tibetans, Palestinians, and many others who can relate to this one. Music is powerful, one reason I love it. 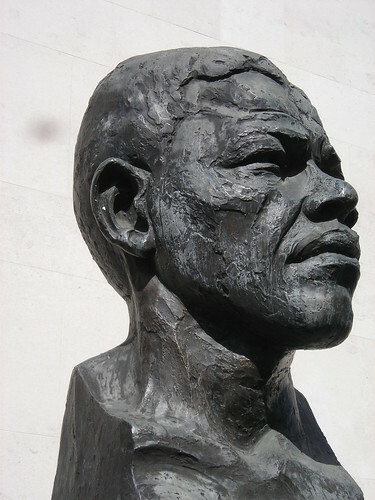 “Majority rule and internal peace are like the two sides of a single coin, and white South Africa simply has to accept that there will never be peace and stability in this country until the principle is fully applied.” – from a letter Mandela wrote to Pieter W. Botha, while still in prison. What if this concept was true in Israel-Palestine, too? Oh man, I wish this would be a phrase that Americans would fold into their concept of patriotism. It’s an axiom. Word. Maybe it was this kind of thinking that gave Mandela the compassion to open his arms to communities who had mistreated him so badly. Thank you and Mandela for these reminders. Thanks for sharing a bit about ‘Nelson Mandela’s great generosity of spirit’. ‘Madiba’ was the glue that held the beloved country together through extremely turbulent times. Forgiveness for the past and hope for the future is the only way for people and countries to move ahead. Thank you!!! it’s great to meet people from different parts of the world interested and concerned about and disseminating issues like this with such strength and socio-cultural importance! Keep it up because you are certainly helping to form opinions around the world!!! Sorry for my english…I’m from Brasil and haven’t practice that much…. Thank you! I was looking for that first quote for a while. It is the one of the things that truly marked my reading of Mandela’s autobiography, but I couldn’t find it anywhere else on the net! Also, glad I fell into your blog like this… It’s nice here. were can we find such a person again like Mandela in Africa?